Tired of pulling the shower curtain shut only to have it pull away from the opposite wall. These German designed and produced clips are the answer. 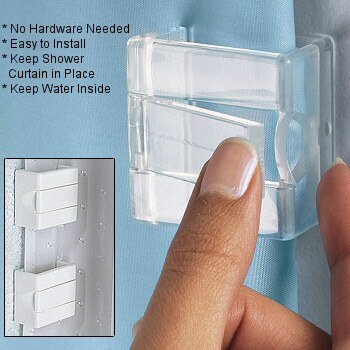 Whether you need to keep the curtain in place or keep water inside the tub / shower these unique clips are the ticket. No tools necessary. Super strength adhesive tape on the back of the clips makes it easy to attach to your wall or tile. Simply peel off the covering on the tape and press in place on a clean, dry surface and you are in business. The clips simply work like a clam shell. Pop open and the mouth of the clip opens and insert shower curtain. The clips will NOT snag your shower curtain and they are very durable and designed for long term use.